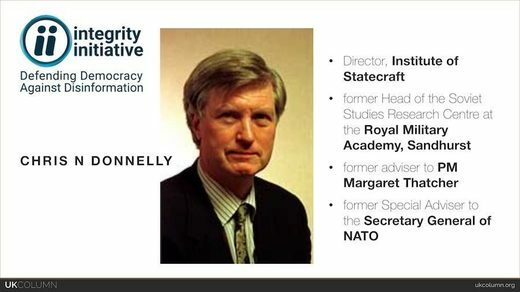 According to the leaks, Chris Donnelly, who heads the Institute for Statecraft (IfS) – the Integrity Initiative’s parent organization – used his NATO contacts and extensive background in military intelligence to try to secure the money for the program. The Integrity Initiative (II) had been positioning itself as an “independent” anti-disinformation charity until hackers began dumping batches of internal documents last November which revealed its government funding and the fact that it was running Europe-wide anti-Russia influence campaigns using “clusters” of cooperative journalists, academics and politicians. In response to the leaks, the II wiped all content from its website and claimed that while some of the documents were “genuine,” others were “falsified” – but did not provide any proof that this was the case. Perceptively,the document– which lays out the projected three-year costs of £5.5 million ($7.87mn) – also recognizes that the program itself could be “identified as external interference” in the domestic affairs of the Balkan countries. Another leaked document notes “Russian hostility” and “traditional Soviet ties” as potential stumbling blocks to the Western influence campaign. The leaks say that the II should “alert” the press, radio and TV journalists to the “relevance” of already-made entertainment like the BBC series McMafia which focuses on a London-based corrupt Russian family. "Integrity Initiative": 6th release of documents. More recently, in Britain, a group of academics were smeared on the front page of the Times for similar sympathies, based on the fact that they publicly expressed doubts over certain anti-Russia media narratives. One of the academics involved called it a “coordinated smear campaign”against anti-war journalists and activists. The authors of the Times report were later named in Integrity Initiative documents, proving the existence of collusion between the British government and pro-establishment journalists to target those who do not stick to certain narratives. In an II “weekly report,” Grant names University of Exeter Professor Jeremy Black and Sunday Times journalist Roland White as two people who expressed interest in collaborating with the II. Roderick Parkes of the Paris-based ISS think tank and Nigel Gould-Davies, an associate fellow at Chatham House, were also named. Hey UK! It’s not just Venezuela, what happened to Australia’s gold?